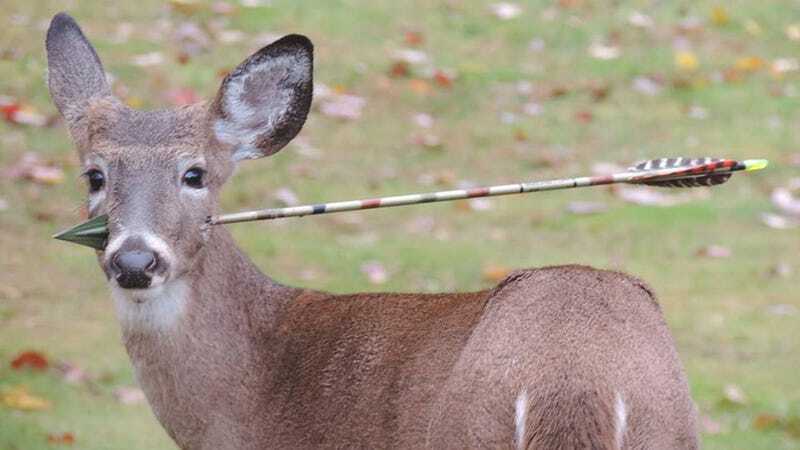 A 5-month-old deer living in the forests of New Jersey was recently discovered wearing this rather unpleasant adornment. Mercifully, biologists from the Department of Environmental Protection were able to remove the arrow this past weekend. A property owner living near Rockaway Township (about 25 miles west of New York City) noticed the deer on November 1st. State officials eventually caught up with it and, after tranquilizing it, performed the surgery at a wooded private property. Miraculously, the arrow did not damage any major arteries or organs. The deer, which has been returned to the wild full of preventative antibiotics, is expected to survive.